MultiWii EZ-GUI is a great tool, best one on the Android market, but it doesn't seem to be supported under OS 4.2, and/or Nexus 7 tablet? I'm able to still run it on my Phone, but a release for 4.2 / Nexus 7 would be great! right now I'm changing a lot in EZ-GUI. I want that all views look the same on different screens because right now it only looks good in WVGA800. Probably tomorrow I release the update and after that I will look at 4.2 compatibility. Right now it is compiled for Android 4.1. I have one question. What do you want to be displayed on Map, because Battery voltage and powerSum/powerTrigger are not very useful as a lot of people don't use it at all. I don't use map, yet as I don't have a gps enabled multiwii... yet, it's in the mail. For me on the map I think # of Satellites and Altitude would be very useful. Or at least the perceived strength of the gps signal. Please include altitude (baro and gps) in map view. So from now everything should look the same regardless screen size. Also information displayed on online map has been changed. Please let me know it these changes works for you. It should be available for android 4.2 from now. Pls keep battery available on Map. Thanks. Bad weather, will not be able to do flight test next few days. 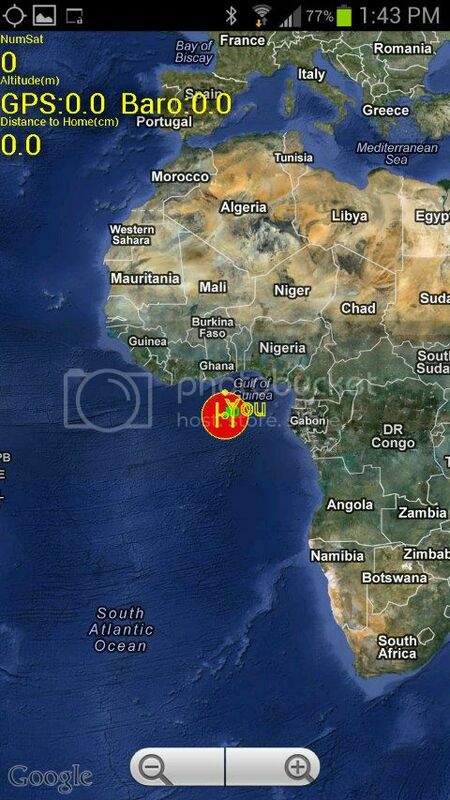 Just checking the out the update, I noticed that the home position and the "you" position stays in South Africa at the Gulf of Guinea. I tried recalibrate acc, to reset home position, but it does not change in the map view. I think the EZ GUI is still reading the phone GPS correctly since map view reverts to my actual location. It also shows the correct location of the copter once it has gps lock. One more minor thing. I hope the red dot that shows the copter location be reverted to the original size. Here, where I fly, the location is very accurate. Example, I can tell where on a park table (center, left side, right side, etc) the copter is on with the origial red dot. With the larger dot, it covers the whole table. Thanks for including the altitude. I can now probably fly using the map view. But also return the voltage as already mentioned. I was able to hook up a bluetooth to the FrSky DHT transmitter module using rs232 to ttl converter and TX/RX RSSI and A1 is showing up in the EZ GUI. Nice! At start up when program doesn't know the copter or phone position it display it at latitude =0 and longitude=0 so this is normal. Yes it's shown up and now been installed on my Nexus 7.... funny thing thou, searching for "multiwii" doesn't bring it up in the Play store, I had to search for "ez-gui"... looks great, didn't have an opportunity to connect it to my multiwii yet, but did check out all the screens, lookin good. maybe Google need some more time to index it properly . I would like to know more in details about the EZ-GUI before I go and buy a Android based stuff and start banging my head on a wall because I missed something.. Can you please elaborate what else do I need in addition to basic set of multicopter based on MultiWii FC + I2C GPS? XBee or BT or something else is needed to transmit the data? Also when I'm using I2C GPS in binary more does the "follow me" feature need any tweaking in MultiWii FC code side to get it running (or does it work with I2C GPS with binary more)? Does the EZ-GUI have any FC raw data logging/playback possibilities? Win GUI has this but it is pretty difficult to use and understand..
What transmission should be used between EZ-GUI and copter, XBee or BT or something else? Here I put my MW code that I'm using with CRUIS SE board. I have made couple of changes ie. I will try to keep this version up to date and compatible with EZ-GUI. Have you used logging function? Does it work correctly? If yes could you send me a example log file when you flying with gps? I'm working on converter to kml format (google earth). and the same in radio transmitter also via level converter to bluetooth module. Last edited by ezio on Fri Dec 07, 2012 2:21 am, edited 1 time in total. Follow me is not fully functional yet. It works but you have to switch return to home on and off to update the coordinates. I'm waiting for MW developers to change it. Almost all data can be logged in EZ-GUI and save to sd card as text file (csv). And I will add soon possibility to convert this log into kml file for google earth. Last edited by ezio on Sat Dec 08, 2012 2:54 am, edited 1 time in total. Hi eizo, i really like your android aplication, it helped me so much these days. What do you think about a feature like: put 3 secconds your finger on the Google map, enter an altitude, press execute, and the copter goes twards that point if you turn on "GPS Home"
One of my customers needs aerial photos each time from the same position. same altitude, to monitor the building progress. Could that be more useful than follow me with curent implementation? Hi ezio, i never used logging as i am an end-user. What bennefits brings logging to a flyer, not developper. Where your flights similar to this ? dramida wrote: Hi eizo, i really like your android aplication, it helped me so much these days. this is very good idea. I think it can be done. More or less, yes! Cool. The starting point pretty much nailed it. The direction is fine, it's just a bit wild, but it doesn't look like a csv to kml problem, more a data problem. I think the bluetooth range is to limited for that, next time i'll strap my phone on the copter. eizo wrote: Follow me is not fully functional yet. It works but you have to switch return to home on and off to update the coordinates. I'm waiting for MW developers to change it. Can someone test and confirm? But this will distroy the real RTH function! It would be better to create temp_GPS_home position! Every time RTH is activated it will return to home. If wp_no 0 is recieved it will be used untill RTH is reactivated. Last edited by PatrikE on Tue Dec 11, 2012 1:59 am, edited 1 time in total. I think that it will work but not for i2c GPS. I have no idea how to do it with i2c. Helo Bart, i saw a new release of EZ-gui on my android. Thank you Can you tell what changes it has? After further tests, I noticed that at the time when my model show from 3-6 GPS satellites, and when the USB Configurator Multiwii show the detected amounts are in your 2.91.45 did not showed. Also used the OLED display and another application called Naze 32 Configurator and there also were shown and the number of found satellites appear to them. dramida wrote: Helo Bart, i saw a new release of EZ-gui on my android. Thank you Can you tell what changes it has? Jantar wrote: After further tests, I noticed that at the time when my model show from 3-6 GPS satellites, and when the USB Configurator Multiwii show the detected amounts are in your 2.91.45 did not showed. Can anyone else confirm this ? Merry Christmas and a Happy New Year to all pilots! Hope everyone gets lots of lipos and motors under their trees! And again merry christmas, and a prosperous new flying year! Crius BT - Samsung Galaxy Tab 2 10.1 latest ez-gui dev_r1275 and gui doesn't want to connect to BT. What's the problem? I'm playing around dashboard 2. @dramida: no i haven't. Yet I'll try today with Galaxy S and Galaxy S 3. Bart, i like the new dashboard! Bigger text is better. How about setting a new home on map and then navigating to it? I made a mod on crius BT and i replaced the pcb antenna with a 30mm wire (lambda/4) and i had continous link until 174m with an galaxy s3. If i could use an external BT with the same antenna mod on a pillar , i bet the BT range would double at least. dramida wrote: Bart, i like the new dashboard! Bigger text is better. Do you have pictures of the mod? Did you just add the wire, or did you cut the trace to the pcb antenna? It should be safe. Protocol hasn't change so everything should work just fine. Please update the app to get GPS working again. I already corrected this bug. Last edited by ezio on Wed Dec 26, 2012 7:14 pm, edited 1 time in total. Yes you are right. Graphs doesn't work on android 2.2. This is due a small bug in graph library. It will be corrected in the next relase. thanks, updated but not tested yet.. and thank you again for you great work. 2.92 For applications did not show me the data of satellites and Graphs did not work. After an exchange of correspondence with the EZIO received from him a revised application code. Now correctly shows the data related to satellites and act Charts. It should soon appear correct version. I use a modified version 2.17 MultiwWii. scrat wrote: @dramida: no i haven't. Yet I'll try today with Galaxy S and Galaxy S 3. Tried on Galaxy S and S3 and gui works on both phones. Just on Tab doesn't want to connect with bluetooth. I think that it is a time to make this software even better. So please let me know about bugs or things which can be improved. #define AP_MODE 20 // Create a deadspan for GPS. When the copter is momentarily controlled by stick, the EZ-GUI behaves erratically by endless repeating GPS- ON GPS- OFF even if no stick input is given after an initial manual maneuver. And but the way, what significance has 20 in the statement "AP_MODE 20" ? 20 us? 20 percent? It should be described as a comment nearby code. It is corrected in r1315. So follow me should now work correctly.